FOOTBALL: The Going Rate; A Look at the PSU transfer schools. The Going Rate; A Look at the PSU transfer schools. I’m trying to stay positive about the whole situation at Penn State - and I’ve been trying to piece together my thoughts on what has happened in the past 8 months - especially the last few weeks. For a community that has, over the years, had to deal with very little “big news,” the onslaught of exposure and commentary and (literally) life-altering events has been, at the very least, overwhelming. As a result of the sanctions imposed on the Penn State Football team, the transfer rules enforced by the NCAA have been reduced to, nearly, nothing. Typically when an athlete transfers from one FBS (div 1A) school to another, he must enroll in the new school and sit out one academic year of competition. This rule has been eliminated with respect to PSU players for the 2012 and 2013 seasons. Any school can contact the currently enrolled players to discuss their program(s) and extend offers; each player is permitted to visit (on the inviting school’s dime) up to 5 schools. Which seems a little crazy as PSU practice starts next week, but the NCAA has “ruled” that transfer recruitment of PSU players is allowed until PSU fall semester begins (August 27th). In addition, the NCAA has lifted scholarship requirements for any school accepting the transfer of a Penn State player. What that means is even if a team is at their scholarship limit (85), they can add the PSU scholarship player to their roster without any penalty. The rules regarding rosters are a little different for teams that are currently on probation/have scholarship reductions, but that is the only limitation. The NCAA has also announced that they will accelerate the paperwork process for any transferring player, thus allowing the immediate transfer of any players wishing to do so. Basically, the NCAA has created a “free agency” situation with regard to the availability of PSU players. They have, little by little, removed any barriers that might have been placed in front of those students wishing to transfer and those programs wishing to talk to them about it. In his presentation of the sanctions levied against PSU football, the president of the NCAA stated that Penn State needs to change its “win at all costs” culture - and focus on academics. But I ask you - exactly how does Penn State focus MORE on academics? Penn State athletes have posted standard setting graduation rates over the years. The PSU football team’s graduation rate is annually among the highest recorded for not only public (related) institutions, but all FBS programs. The value of an education or major or class choices is, again, a more subjective matter and I realize that graduation rates alone do not prove that one program emphasizes academics more than others (really? ); however, they are a good indicator as to why the players themselves might choose a school and what they are doing while they attend. Through my experiences I have come to the realization that very little of what is reported or written down is “fact.” Nearly everything is subject to some element of opinion or influence. Even numbers can be skewed depending on the researchers’ objective - and the same can be said for graduation rates. There are 2 different graduation rates that are published for college athletes: the Federal Graduation Rate (FGR); and, the Graduation Success Rate (GSR). Both rates calculate graduation percentages, every school year, for each school, based on the number of student-athletes that complete their degree within 6 years, but they differ in how they account for athlete mobility. The Department of Education calculates the FGR based on the players who matriculated to the subject school 6 years prior to the “graduation year.” So, basically, if 10 freshmen join the Boise State field hockey team, and 6 years later, 8 of them have earned degrees (from BSU), then the field hockey team has an FGR of 80%. The NCAA Critics complain that the FGR does not take into account students that transfer from (to another accredited program/school) or into the school, but still graduate within the 6 years. The NCAA developed the GSR to factor in the transfers of students to and from the schools. Without getting too much into the “numerator and denominator” bit, basically, the GSR calculates graduation rates by removing athletes that transfer away from a school (while in good academic standing) and adds in athletes that transfer into a school and go on to graduate. It’s a tricky game and my purpose here isn’t go get into a discussion about math - but, before we get to the “transfer numbers” let me say 2 things: (1) over-signing; and, (2) JUCO. Okay. 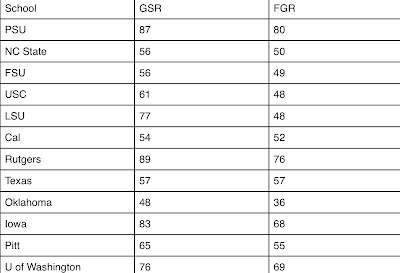 So, now turning specifically to football, let’s look at GSR and FGR (2010-2011) for the schools that have accepted transferring PSU students and see if the NCAA has afforded them a chance to escape the “football culture” that Penn State permeates. I’ve added PSU’s numbers as a typographical biting of the thumb comparison. And I’ve added Pitt and U Washington just for fun. 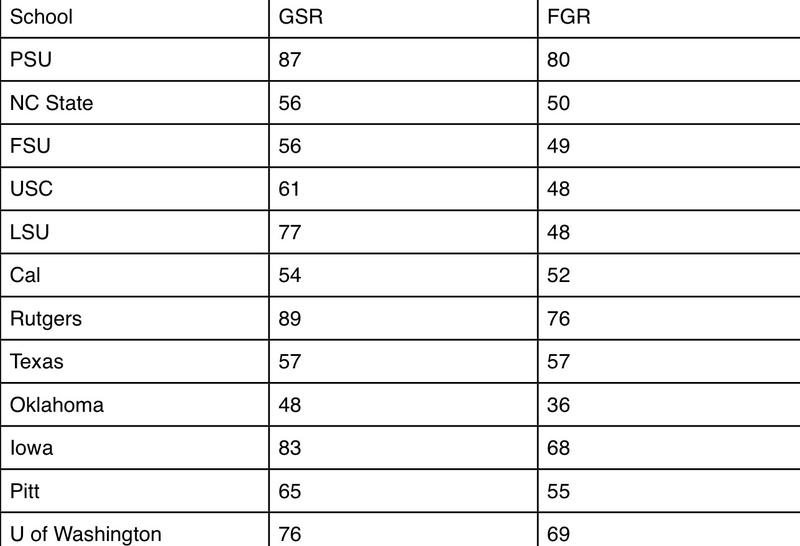 Kudos to Rugters and Iowa on their high GSR, but the stark contrast between the majority of the “accepting” schools and PSU is laughable, if not cryable. There is no credence to any argument that Penn State failed to focus on academics. Perhaps these PSU transfers can assist their new schools’ GSR in years to come. Let me be very clear, I do not wish ill will on any of the players/students that are transferring, they have been through an unimaginable upheaval this past year (8 months) and the fact that any of the kids are staying is quite remarkable. But what I do wish ill will on is the facade of academic sensibility spewed about by Dr. Mark Emmert in an attempt to legitimize the NCAA overstepping its bounds. And as I’ve said elsewhere - these relaxed (and ever changing) transfer rules are not to help the players, or even to twist the knife a little more in PSU’s back, it’s to reduce the cause of action that the players might have against the NCAA; it’s all business. I took the comment about focusing on academics in a slightly different vein. The way I understood the statement wasn't an indictment on the football players themselves. Instead, I took it to mean that the university had different rules/culture surrounding the football team versus the general student population. I could be wrong and conversely you may be correct, but that was how I understood it. this is my reaction to his comments regarding the erosion of academic values being replace with hero worship and winning at all costs. I guess I don't understand how the graduation rates for the football team proves or disproves anything. It seems to me like he was talking about the hero worship of the football team by the PSU community (students, faculty and staff). Although I disagree with his assertion that academic values were eroding, I think he does have a point re the hero worship and winning at all costs mentality. Just my opinion, I don't mean any disrespect. I will say, that if PSU was winning at all costs, they were doing a poor job of it. As I mentioned above, graduation rates don't really show anything, except maybe that the athletes attending the universities with the higher averages maybe wanted a degree as well as an opportunity to play their sport. However, it does signify, to some degree the emphasis of a school/department/team. If a school's athletes are graduating, then, by default (and, of course, recent reports could suggest otherwise) they are getting an education - they are encouraging academics, if not emphasizing. I will never be convinced that Penn State football put winning ahead of education, because, rightly or wrongly, academics, as much as any final score, became the message of PSU football. To suggest, force or facilitate the transfer of student-athletes into programs where, statistically, they have a lesser chance to achieve a college degree - does nothing to "send a message" to other programs or change the supposed culture of college football. I know of no other coach in the entire NCAA who with his wife has tutored students at their kitchen table.